Today was day one of two weeks of Grand Jury duty. By law I cannot discuss the tedious, excruciatingly boring day I had on jury duty. Hopefully it will get better. However, I am free to discuss where I went for lunch. My plan is to hit ten different Chinese restaurants over the ten days of my service. I am going to try to avoid favorites like Nom Wah Tea Parlor and stalwarts like Joe's Shanghai and Wo Hop. I am also going to avoid the standard fare of your local joint. No General Tso's. No Mu Shu Pork. Instead, I am going to dig a little deeper. First up, Big Wong King. Big Wong King is a classic Mott Street restaurant. It is a bare bones, no frills restaurant. The service is brusk and no nonsense. You will be whisked to a table as soon as space opens up. Don't be surprised if you are seated with another party or person. The tables are communal and the folks at Big Wong have no interest in having a single seat open. Rich, slightly greasy, Big Wong's roast duck is moist, succulent and delicious. The duck was served cool. It was meaty with minimal fat. I would go back to try it in different dishes. One of the dishes Big Wong is most known for is Congee. I will admit I have never been a congee fan. It may be that I have never had good congee, and I believe congee is one of those dishes that can turn you off for life if you have a bad version. But I wanted to follow the spirit of my challenge, and the dish that most people talk about at Big Wong is the Congee with Shredded Pork and 1000 Year Egg. I went for it. I am officially a congee convert. Big Wong's Roast Pork Congee was a revelation. Thick and warm, this congee is comfort food at it's core. The congee has a subtle depth of flavor that is complimented by rich bites of salty roast pork, the sharp bite of scallions and meaty chunks of mushroom. Each spoonful soothes the soul, and warms you up on a cold February day. Yeah, I finally get it. I think the total time between ordering my food and it hitting the table was all of two minutes. My bill was under $13. I was full, happy and had plenty of money left in my pocket. As I paid, I noticed a few trays of some kind of fried bread behind the counter. Apparently Big Wong makes a savory and a sweet fried dough. I had to try one. I went for the sweet fried dough. 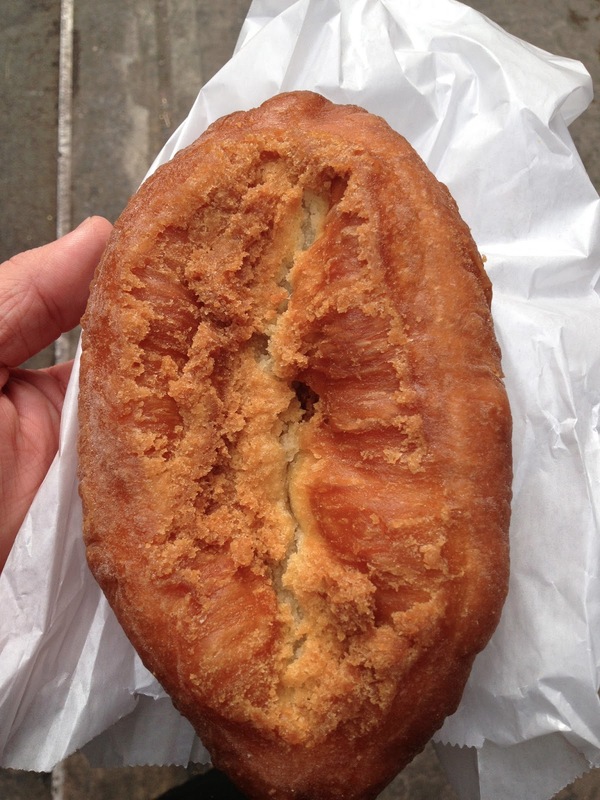 Imagine a zeppole the size of Portuguese role with a crispy, sweet topping. Excellent. 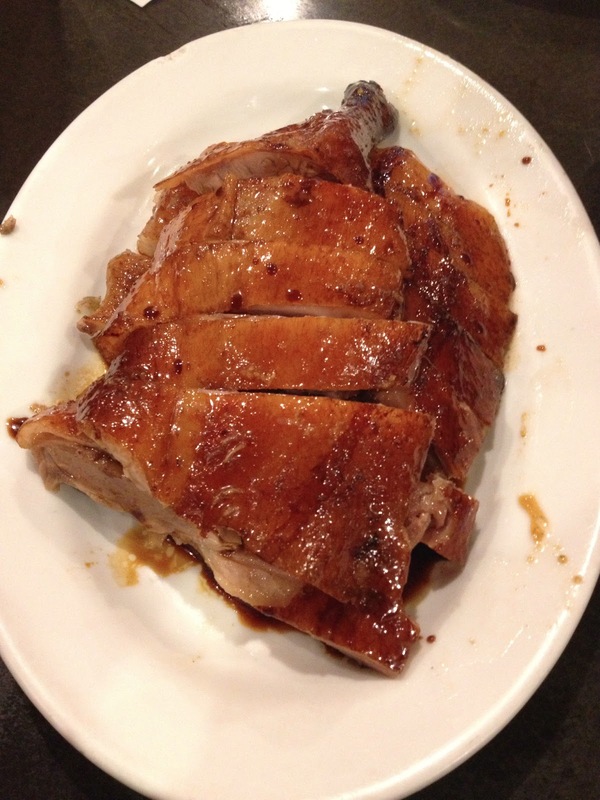 Big Wong King is that classic, cheap Chinatown Restaurant you are always hoping to find. It was the perfect place to start my project. The bar has been set. Where to next? Information and pictures are to good.